STOP HS2 | Stop HS2 response to potential Chinese investment in HS2. Stop HS2 response to potential Chinese investment in HS2. Today, both the BBC and Sky have reported that the China Development Bank, which is wholly owned by the Chinese Government, wants to invest in HS2 and more nuclear power stations in the UK. Last July, former minister of railways Liu Zhijun was sentenced to death for corruption, a sentence which was suspended for two-years. 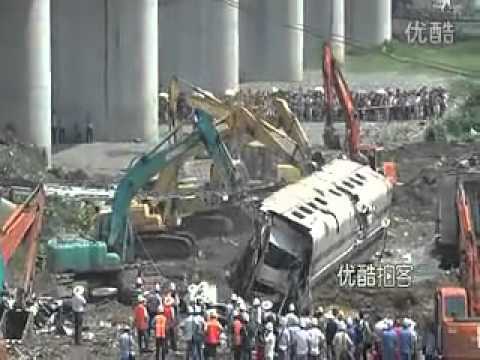 In 2011 following a high speed rail crash in of Wenzhou which killed 40 people, Chinese authorities took part in a quite literal cover-up, burying the wreckage at the site. China has offered to allow British firms a role in the construction of a 123km undersea tunnel in northern China in return for granting Chinese contractors a part in the UK’s planned high-speed rail network, HS2, and its new generation of nuclear power stations. The tunnel in question runs beneath the Bohai Straits between the cities of Dalian in Liaoning Province and Yantai in Shandong Province. The value of the project, which will be more than twice as long as the the Channel Tunnel, is about $40bn. “Britain is obviously interested only in our money. They think China is a cash cow. Possibly China is interested in using Britain to fund it trillion pound backlog for public services facilities. If the Chinese can build a tunnel 123km under the sea for40billion dollars why can’t we put the whole of hs2 in a tunnel and save 20billion ? Yet again, the whole HS2 project stinks. As Joe Rukin implies, if HS2 goes ahead, it will be at an eventual high cost, as the Govt. will attempt to accept Chinese involvement i.e. money so as to keep the apparent cost below “Budget”. All to feed Cameron’s vanity. Or I am I being cynical? China needs to raise trillions of pounds and obtain a hard currency rating. They will spend tens of Billions to widen Western Borrowing. They have topped out in USA and now want UK to do their persuading. Another PM duped by over extending credit. You should borrow within real limits. You know who you borrow from and the consequences. It appears the Government PM and Chancellor did not learn the basics on their way to power.